Shell mounds, called midden, can still be found today in many parts of southern Florida. Environmentalists and conservation groups protect many of these remaining shell mounds. One shell mound site is Mound Key at Estero Bay in Lee County. Its construction is made entirely of shells and clay. This site is believed to be the chief town of the Calusa, where the leader of the tribe, Chief Carlos lived. In Palm Beach County the most famous midden mound is found near the Jupiter Lighthouse. The Dubois home on the Loxahatchee River is built on an old Indian mound. Archaeologists have excavated many of these mounds to learn more about these extinct people. Artifacts such as shell tools, weapons, and ornaments are on display in many Florida history museums. For thousands of years, Southwest Florida’s Calusa Indians paddled the rivers and back bays of this area. These earliest residents were well adapted to their land and fierce warriors (Calusa means "the fierce people"). But the 16th century brought the Spanish, Ponce de Leon among them, and the Calusas’ way of life was changed forever. This would be a recurring theme. By the mid-18th century, through a combination of war, disease, and dissemination, the Calusa were lost to history. A culture went extinct. The Calusa Indians, believed by many to be descendants of the Mayans, lived on the sandy shores of the southwest coast of Florida. These Indians controlled most of south Florida. The population of this tribe has been estimated at 10,000 to as many as 50,000 people. The Calusa men were tall and well built with long hair. Calusa means "fierce people," and they were described as a fierce, war-like people. Many smaller tribes were constantly watching for these marauding warriors. The first Spanish explorers found that these Indians were not very friendly. 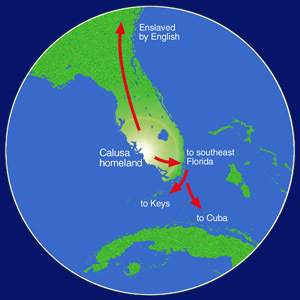 The explorers soon became the targets of the Calusa attacks. This tribe was the first one that the Spanish explorers wrote home about in 1513. That would turn out to ultimately be a very bad stroke of luck. They were a big and powerful lot! They were powerfully built men, often four inches taller than their European counterparts. In the warm Florida sun, they let their hair grow hip length and wore only tanned breech clouts of deerskin fastened with fancy belts indicative of one's position in the tribe. The women dressed in garments of woven Spanish moss and palmetto leaves. The Calusa were great sailors. Their large canoes of hallowed out cypress logs were capable of reaching Cuba, perhaps Mexico. Their language indicated they may have traveled to Florida from the islands. They did little farming, but were outstanding hunters and fishermen. Due to their warrior reputation, the Calusa also gained tributes of food from smaller tribes. They were the bully on the block, so to speak. The Calusa lived on the coast and along the inner waterways. By looking at the remnants of Calusa villages it was discovered that they built their homes on stilts and wove Palmetto leaves to fashion roofs, but they didn't construct any walls. The Calusa Indians did not farm like the other Indian tribes in Florida. Instead, they fished for food on the coast, bays, rivers, and waterways. The men and boys of the tribe made nets from palm tree webbing to catch mullet, pinfish, pigfish, and catfish. They used spears to catch eels and turtles. They made fish bone arrowheads to hunt for animals such as deer. The women and children learned to catch shellfish like conchs, crabs, clams, lobsters, and oysters. Some forty coastal villages spread along the Florida Gulf Coast, with Mound Key near the mouth of the Caloosahatchee River the largest village. Despite the lack of domesticated animals and heavy tools, the Calusa built huge mounds of shell and deep moats to protect their villages of raised huts. Burial mounds and a temple mound for ceremonies encircled the village. 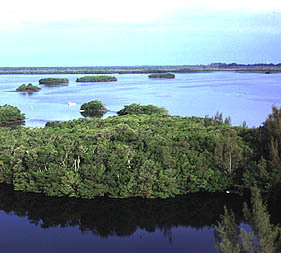 The Calusa's reputation was well established. The hereditary chief and the dolman or priest ran the villages. They practiced sacrificial worship and demanded obedience from all villagers. The Calusa had a rather closed society and the Spanish would discover little interest in missionary activity from the Calusa. The Caloosahatchee River ("River of the Calusa") was the main highway of the Calusa into the interior. Its banks teamed with small game and its waters were abundant with fish and shellfish. Calusa canoes could circumvent Lake Okeechobee and travel up the Kissimmee River into other tribal areas. The Calusa are considered to be the first "shell collectors." Shells were discarded into huge heaps. Unlike other Indian tribes, the Calusa did not make many pottery items. They used the shells for tools, utensils, jewelry, and ornaments for their shrines. Shell spears were made for fishing and hunting. Living and surviving on the coast caused the tribesmen to become great sailors. They defended their land against other smaller tribes and European explorers that were traveling by water. The Calooshahatchee River, (which, you'll remember, means "River of the Calusa,") was their main waterway. They traveled by dugout canoes, which were made from hollowed-out cypress logs approximately 15 feet long. They used these canoes to travel as far as Cuba. Explorers reported that the Calusa attacked their ships that were anchored close to shore. The Calusa were also known to sail up and down the west coast salvaging the wealth from shipwrecks. What Happened to the Calusa? What happened to these fierce sailing Indians? The Calusa tribe died out in the late 1700s. Enemy Indian tribes from Georgia and South Carolina began raiding the Calusa territory. Many Calusa were captured and sold as slaves. In addition, diseases such as smallpox and measles were brought into the area from the Spanish and French explorers and these diseases wiped out entire villages. It is believed that the few remaining Calusa Indians left for Cuba when the Spanish turned Florida over to the British in 1763. This truly is a history mystery.